After sampling the slightly unorthodox fusion tapas at Can Kenji, we partook of more traditional offerings at Tapas 24, Carles Abellan’s most recent addition to the Projectes 24 stable. I ate at his other, more upscale tapas joint Comerç 24 a few years back and although I don’t recall specifics, I do remember enjoying the chef’s intricate creations. Open 8am to midnight daily, Tapas 24 entertains walk-ins only so we turned up early (by Spanish standards anyway), just after midday and were rewarded with a swift entry into the near-empty bar. It was lucky we arrived when we did though, for no sooner had we ordered than the crowd began to filter in. 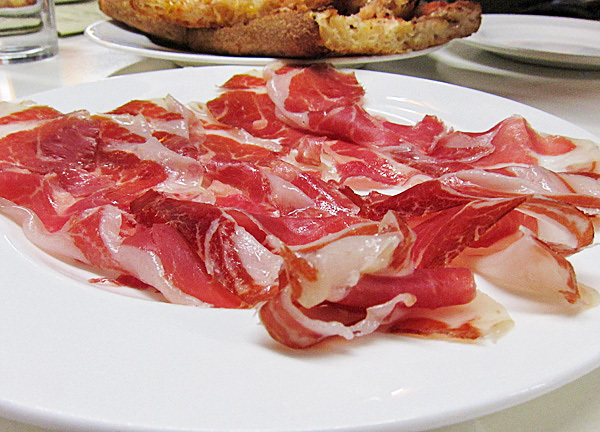 We started with some usual suspects – thinly-cut Jamón Ibérico was gloriously salty with a good ratio of fat and a deep flavour. I piled ribbons of it onto the crusty squares of Pan con Tomate (bread rubbed with fresh tomato and drizzled with olive oil) and chomped away happily. 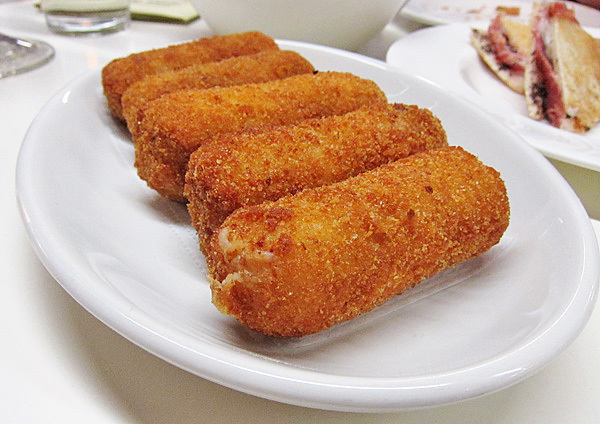 Croquetas, one of my favourite Spanish snacks, were textbook – crisp coating of fine golden breadcrumbs and thick velvety ham-scented bechamel. 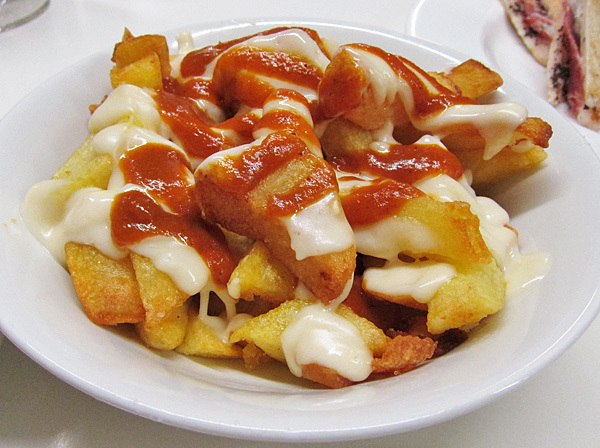 A bowl of fried Patatas Bravas was quickly emptied: the fluffy fat chips smothered in creamy aioli and paprika-spiked tomato sauce were hard to resist. The signature Bikini Comerç 24, essentially a posh take on a grilled ham and cheese, featured cured Iberian ham, buffalo mozzarella and black truffle sandwiched between white bread. 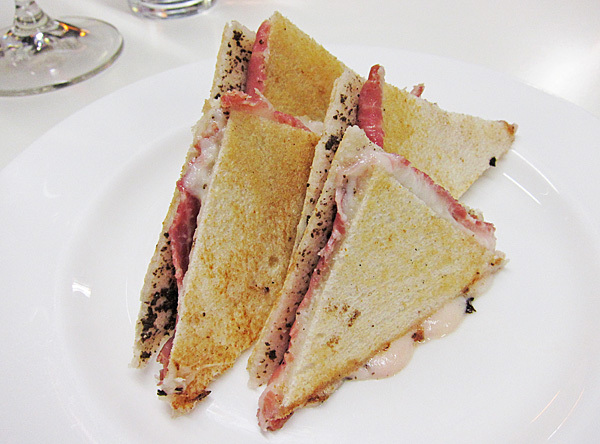 While ham and melted cheese is never a bad thing, it didn’t quite deliver – there was barely any truffle aroma and the anaemic toast could have done with more grill time. 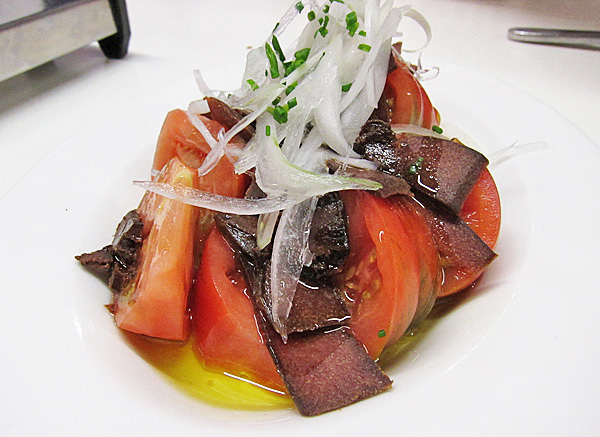 Tomato and Tuna Roe provided a refreshing interlude between the protein-heavy and carb-laden small plates. The tomatoes could have been riper (it’s not yet season) but the intense dried fish roe tempered their bright acidity and tender sweet onions added a pleasing gentle bite. 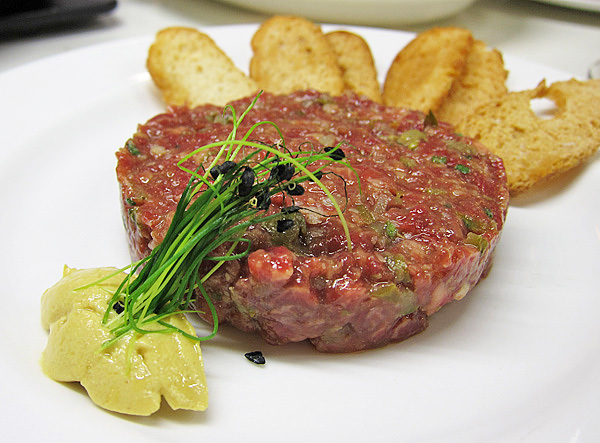 Steak Tartare was elegantly presented and a decent rendition of the classic. 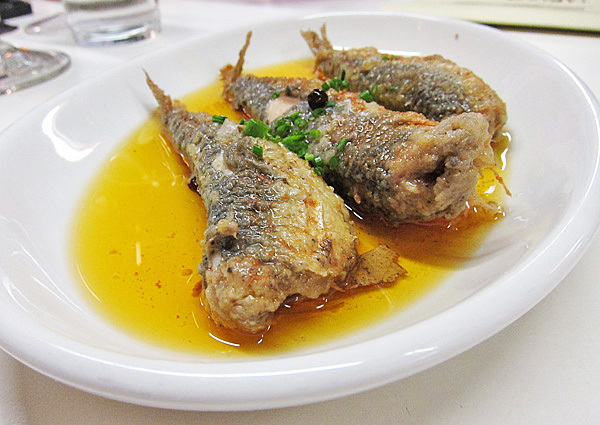 I don’t believe I tasted the Sardine Escabeche but we definitely ordered it (given the photographic evidence) – with that many plates and six eating, missing a dish is easily done. I’m sure it was fine though as I heard no complaints and it looks nice enough. 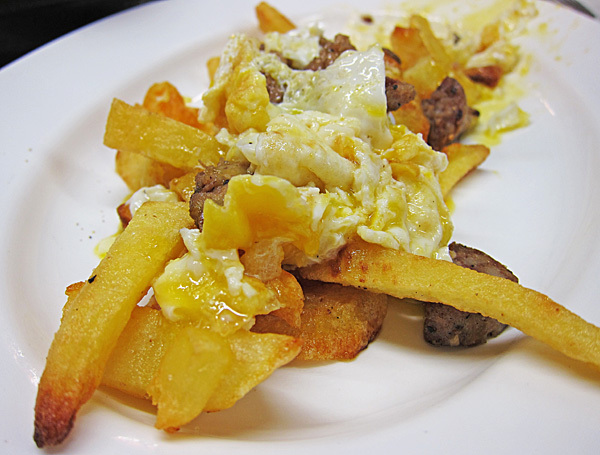 Smashed Fried Eggs with Potatoes sounded exciting but turned out to be just roughly-scrambled eggs strewn over some fries. We ordered ours with white sausage (you can opt to have them plain or with a selection of meats) which presented itself as dry pitiful chunks dotted around the plate. Disappointing. 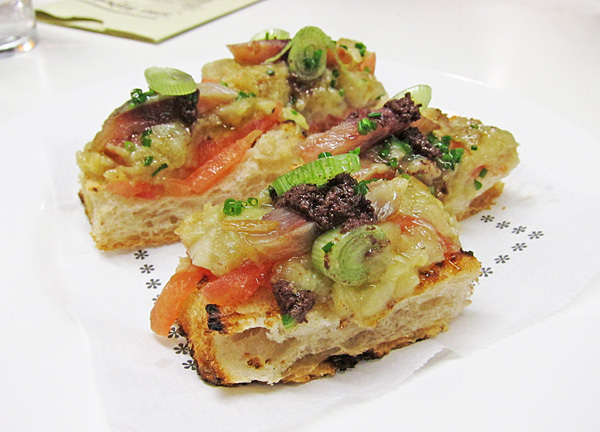 Catalan Bread topped with Tomato, Aubergine, Herring and Tapenade was a lovely bite of many textures – the most special of which was the smooth silky aubergine flesh. In addition to tapas there were a few more substantial dishes on offer; the two stews we had were both excellent and dishes we would return for. Oxtails cooked with beans were meaty, delicious and fall-off-the-bone tender. 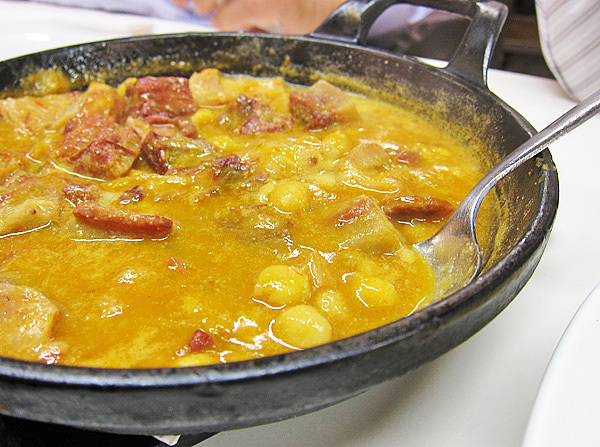 Even better was the Tripe cooked with Chickpeas and Chorizo which the carnivores on our table eagerly mopped up with bread, although admittedly it ain’t too pretty. The dessert list was limited but the ones we tried were both good. 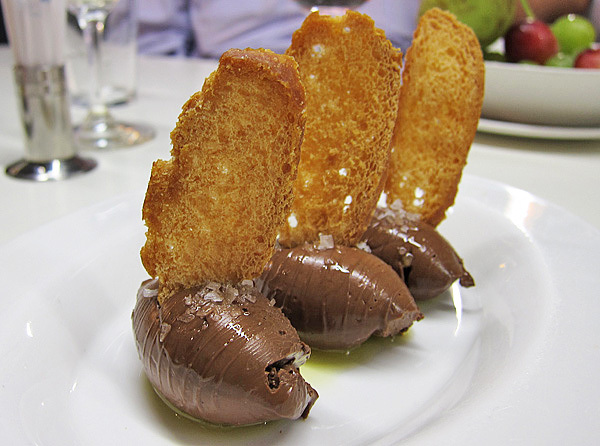 Sugar-dusted Pastries filled with eggy custard paired well with coffee, and the quenelles of rich dense Chocolate Mousse sprinkled with coarse sea salt and olive oil were simply divine. We departed satisfied and very full, passing a mixed queue of tourists and locals as we went. Great tapas worth waiting for, and at reasonable prices too – although naturally if you have a healthy appetite (like us) it will stack up. ~ by gourmettraveller on May 10, 2011. 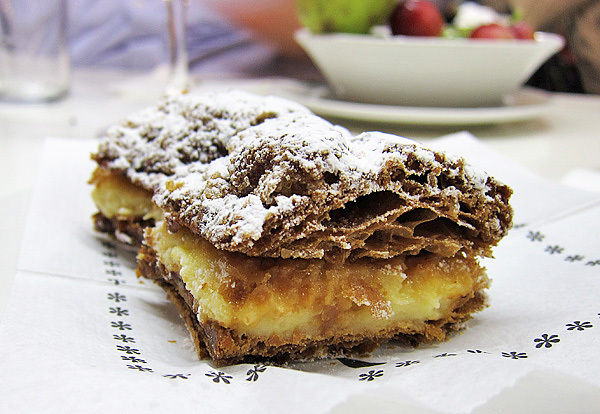 This makes me really hungry to go back to Barcelona. Last year I stumbled into this hole-in-the-wall and within the 5 days of my stay I returned to Tapas24 three times. It’s the best, reasonably priced food we came across. Funnily enough, I found Tapas24 more memorable than El Cellar De Can Roca! I wonder if they’d still do the whole burrata and the McFoie burger? Wow, high praise… makes me feel a bit better about not having made it to Can Roca this time round! I didn’t see the burrata on the menu but McFoie burger was definitely on there, and now that you mention it I’m not sure why we didn’t order it. Dammit. These pictures made me so hungry! I’m off to Barcelona mid June so it’s brilliant to be able to read your reviews before heading off. 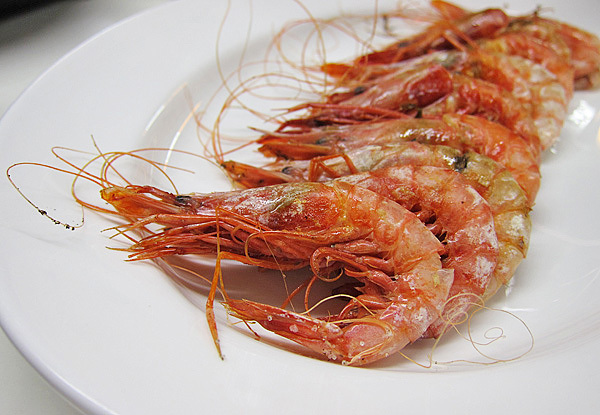 Cal Pep is another tapas institution on my ‘to do’ list, and I’ve now met two Spanish people who’ve recommended Can Majo – did you make it there? Thanks for these two great reviews – can’t wait to experience it for myself! 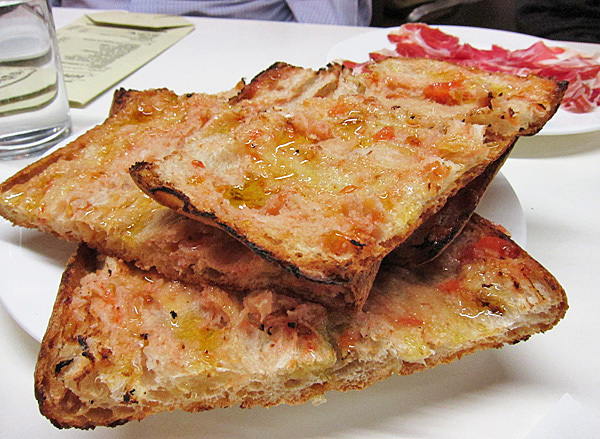 Didn’t make it to either – there are just too many fantastic places to eat in Barcelona! If you’re looking for something higher-end as well I would recommend Cinc Sentits. I’ve eaten there twice on previous trips and have loved it both times. I had my eye on there too – thanks for the recommendation! OK, another one for the list! I had been wanting to try Inopia but then sadly, it closed. This will do! Lovely post and pictures! We wanted to go to Comerc 24 during our recent wedding anniversary trip to Barcelona, but stupidly did not bother to make reservations well in advance so weren’t able to. Next time definitely! Cool. I am adding this to my list of eateries whenever I visit Barcelona. 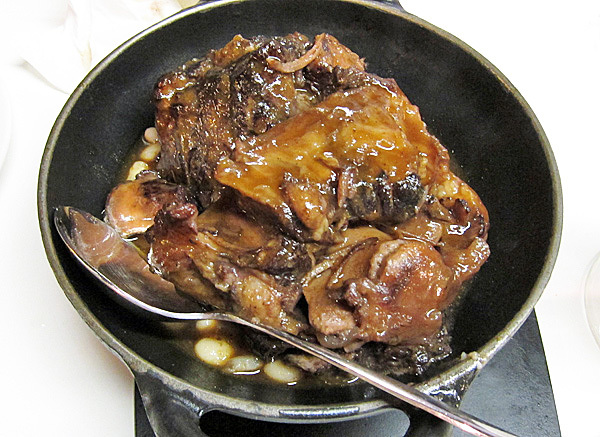 Oxtails with bean is one of those dishes I love to try whenever in Spain. I visited Barcelona a few weeks ago and finally got around to writing up my review of this place (here http://bit.ly/noqYMd). I thought the standard tapas was good, but standout dishes for me were the bikini (which I see you didn’t enjoy, maybe they have perfected the recipe since your trip?!) and the McFoie burger which was outstanding. Also loved a dish of chard, potato and leek which I have since recreated at home. Thanks so much for a great post and for inspiring me to visit!